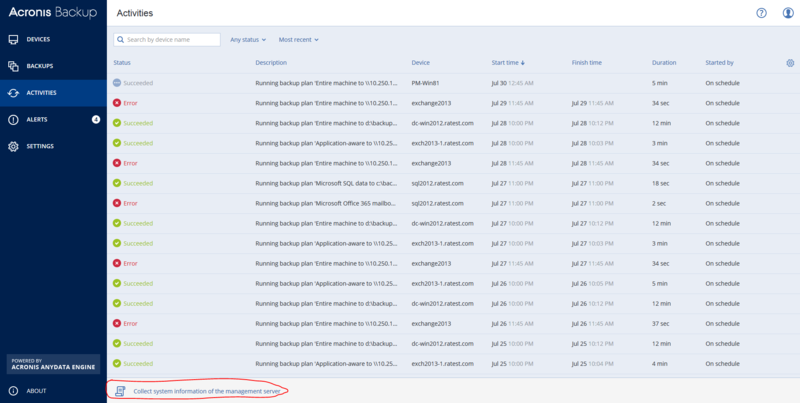 When I was running the BETA version of Acronis Backup 12 for Virtual Host, email notifications worked fine. Now when a Backup Plan completes, no email notification is received. However, when I test the email under the settings area I do receive the test email. I have tried changing the Backup Plan to use "customized" and it still does not send the email notification. I have tried several email accounts, all test fine. However, the backup plan does not. Please, collect system information and attach it to this thread. To collect system information you should select machine in the web console, click "Activities" and click "Collect system information" at the bottom. Please see attached sysinfo file. Can you also send to us system information from the machine where AMS is installed? That's what I sent you. In sysinfo that you provided I don't see any logs related to AMS. Can collect sysinfo using another method as shown in the attached screenshot? Go to "Activities" on the navigation panel and click "Collect system information of the management server". I attempted to upload the file but received a message saying the sysinfo.zip file (31.94 MB) exceeded the maximum file size of 15 MB. Philip, I shared with you folder in Acronis Access. Please, upload sysinfo.zip to that folder. The folder link you sent me via email was invalid. Please provide your technical support telephone number. I have two outstanding issues to resolve. Please, use this link http://www.acronis.com/en-us/support/contact-us.html to get tehcnical support telephone number.